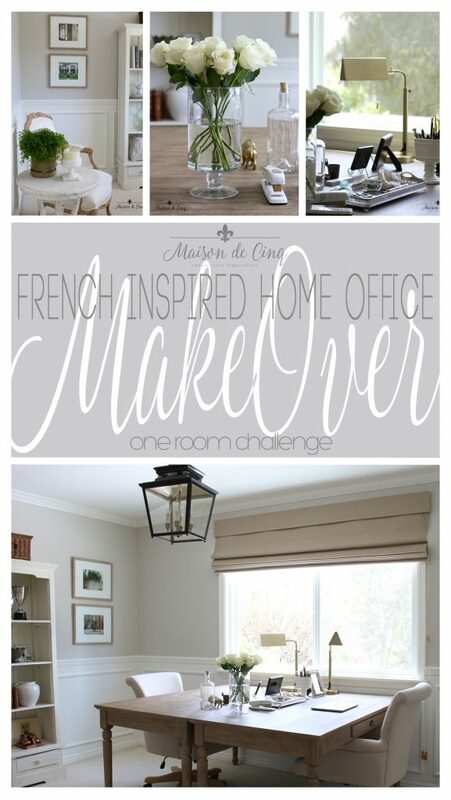 French-Inspired Home Office Makeover - One Room Challenge Reveal! 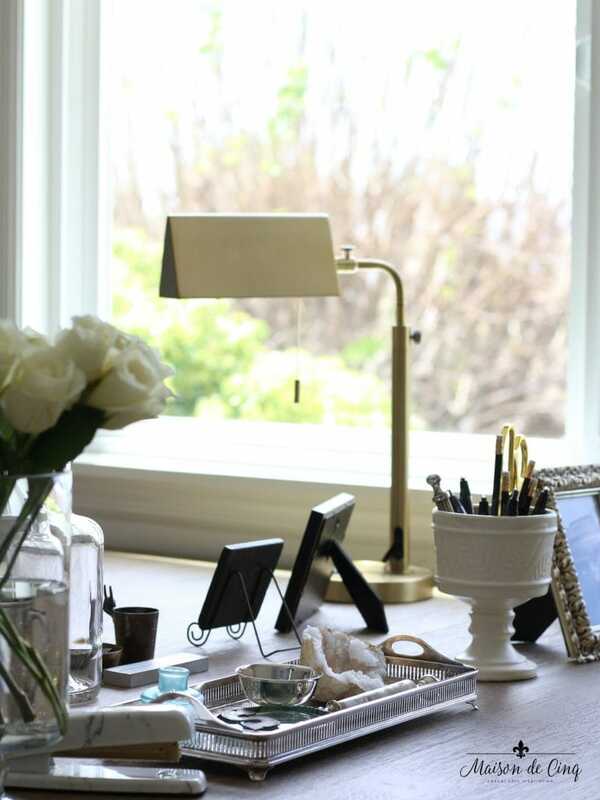 My French-Inspired Home Office Makeover – The One Room Challenge Reveal! Well, this is it! After six weeks of planning, ordering, running around, set-backs, and a last minute flurry of activity, I’m finally revealing my French-inspired Home Office Makeover! 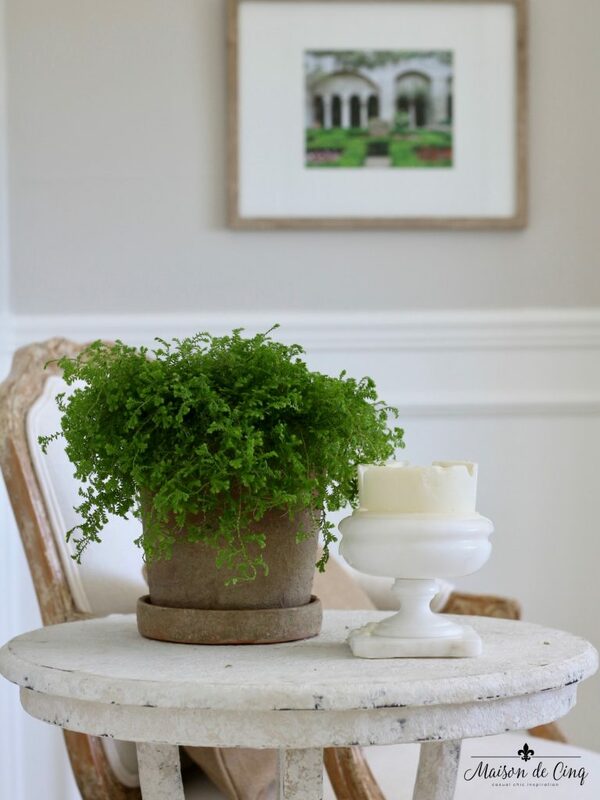 This was my very first One Room Challenge, and I’m so thankful to Linda of Calling it Home for creating this event where designers and bloggers have a chance to design a room from start to finish. And I have to say – I’m hooked! Because, though it was stressful at times, it’s also incredibly satisfying to be actually and completely done with decorating a room! Normally my rooms start off with a bang, and then I get busy and they get left in the dust, half-finished (I’m talking to you master bedroom!) Or, I run out of money, or I can’t find something to finish the room and I move on, or other house expenses/repairs take priority…. 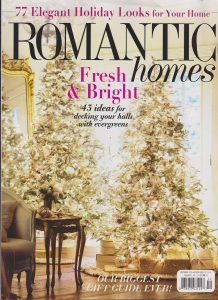 there are a dozen reasons why most of my house stands at a sort of half mast of decorating! So to say I’m excited about how the office turned out is a bit of an understatement. I’m beyond thrilled with it, and I can’t wait to share it with you! So here we go…..
Every time I walk by this room from the hallway or come in here to get something, I catch myself smiling. And working in here has been so nice! I am actually writing from this space right now, and it just feels so good to be in a space that reflects me. It’s not an afterthought, or a space that is utilized for several different purposes. For the first time, we really have a proper office! Should we see where we started? The biggest change was ripping out the old, falling apart beadboard and installing the new wainscoting. I absolutely love the character it adds to the room, and it definitely makes it feel more like an office space to me. We had that professionally spray painted white, and we also painted the upper walls a soft greige color. 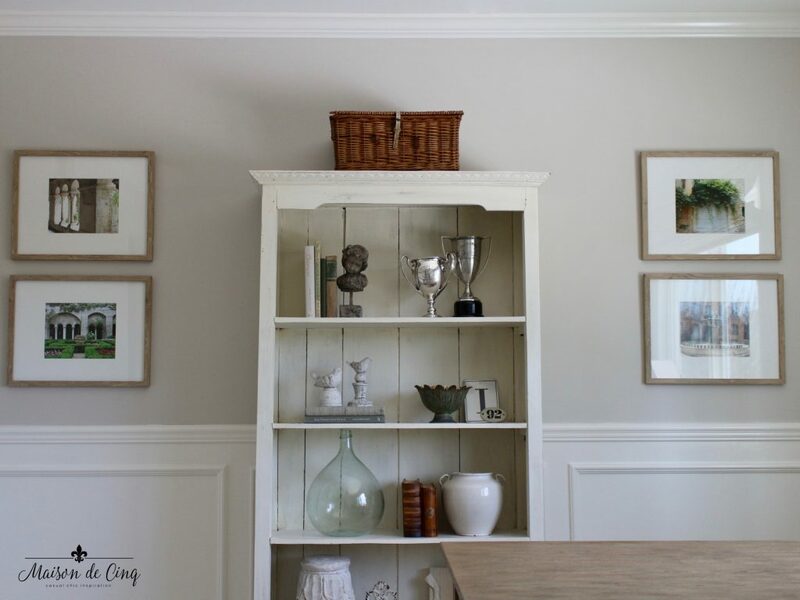 If you want more details on the wainscoting installation, you can find it in this post. I’ve added the French chair and side table to the long wall as a place holder for now. Eventually, I’ll be getting more of an overstuffed chair for this area (possibly even one that pulls out to a twin sleeper as an extra bed for company). But this gives you an idea of what it would look like with something on that wall. Also, that is the wall that is waiting for the large architectural piece that is on backorder (more about that fiasco in this post). I will definitely update this when that arrives and is hung! I kept it pretty simple as I didn’t want it to look too busy. 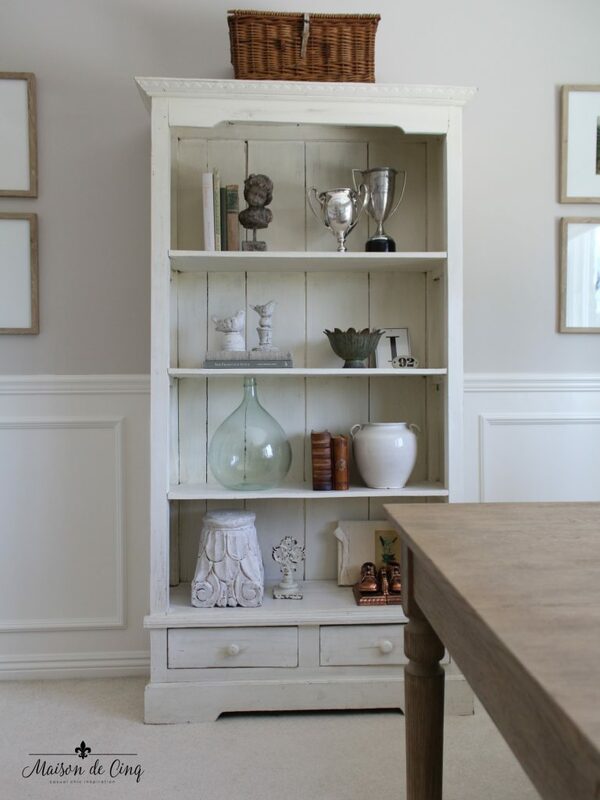 I’ve filled it with mostly vintage and antique items, along with some sentimental things to make it more personal. I’m so happy with the Pottery Barn desks, and my husband loves them, too! They are huge, which is great. Though I did have to adjust my plan of having them in the middle of the room due to their size! And the Pier One chairs are working out – I can attest to their comfort as I’m sitting in one right now! The photos that we took in France came out great, too and I love having mementos from a trip that was so special to us. And I’m super happy with the Target frames! (more about that find in this post). The whole room just feels so peaceful and serene. And the fact that I finally get to work in an office that is pretty makes my heart so happy! My previous “offices” were split between the hot/cold garage, family room couch, or dining room table! Looking across the other way is the closet side of the room. I’m hoping to get something for that wall space next to the window. Possibly a small painting or a mirror, but I ran out of time. I didn’t want to hang something just to fill the space so I’m still looking for that. 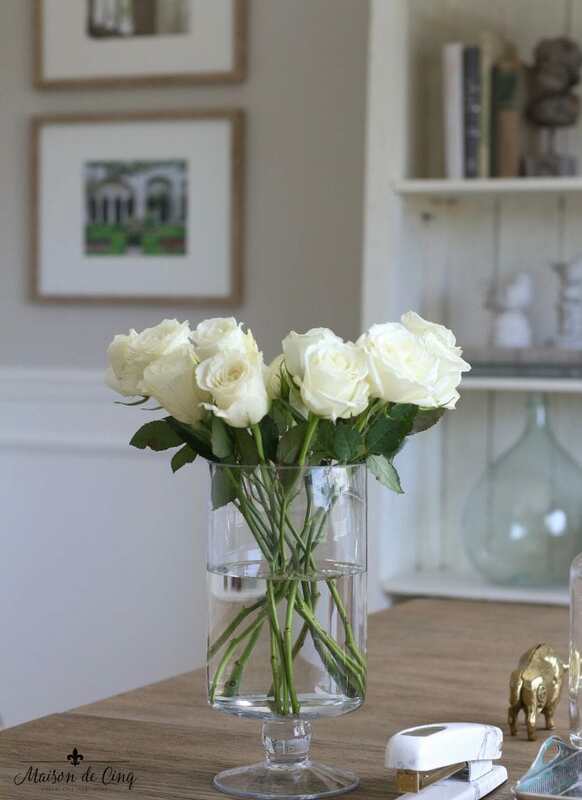 The lantern is a favorite of mine – I have it in the family room as well! 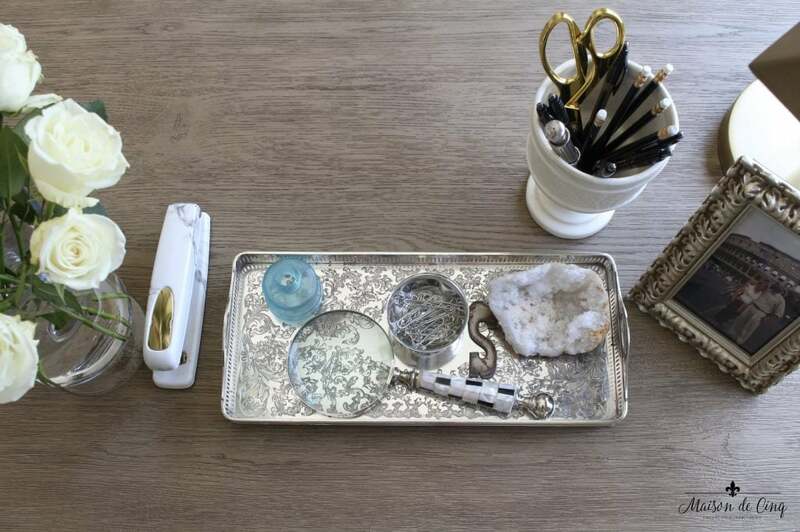 I’ve tried to keep the desk pretty clean as well, with just a few necessary items and a couple of ‘pretties’ on top. I had to convince my husband that every single thing does not need to be kept on the desktop, haha! I also want to thank all of you for following along with my home office makeover. I’ve gotten so many nice comments, emails, and DMs here and on Instagram and it’s been such fun to have all of you with me. The suggestions and support have meant so much! 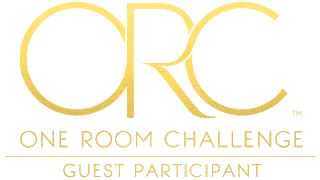 Thank you again to the One Room Challenge for opening this up to all bloggers – it’s been such a wonderful experience for me! 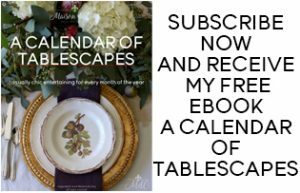 You can find the featured designers participating here, and to see all the other bloggers linking up go here. Lastly, I want to give a huge thank you to my handy husband! He spent many hours installing the wainscoting, as well as helping me with all kinds of projects. From painting the walls, to hanging artwork, to carrying any and all heavy objects – I wouldn’t be able to do much of what I do without his help! 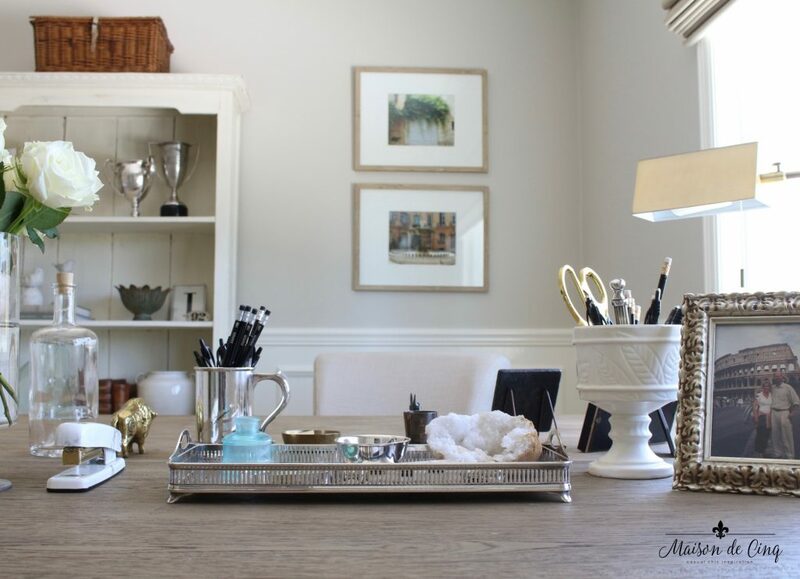 I hope you’ve enjoyed the transformation of this home office makeover. If you want to find any of the sources of the products I’ve used, I’ve linked them below. Also, where there isn’t the exact same item, I’ve found some similar items for you as well! Scroll & Click to Shop the Post! FURNITURE: Desks | Chairs | Bookcase is vintage (similar here, here, and here) | French chair is thrifted (similar here, here, and here) | Table is from Arahaus (discontinued) but this one is an almost exact copy, and these are also similar here and here. and the desks are so good! Thank you so much for stopping by- I so appreciate you coming over and taking the time to comment! Wow, what a beautiful office. 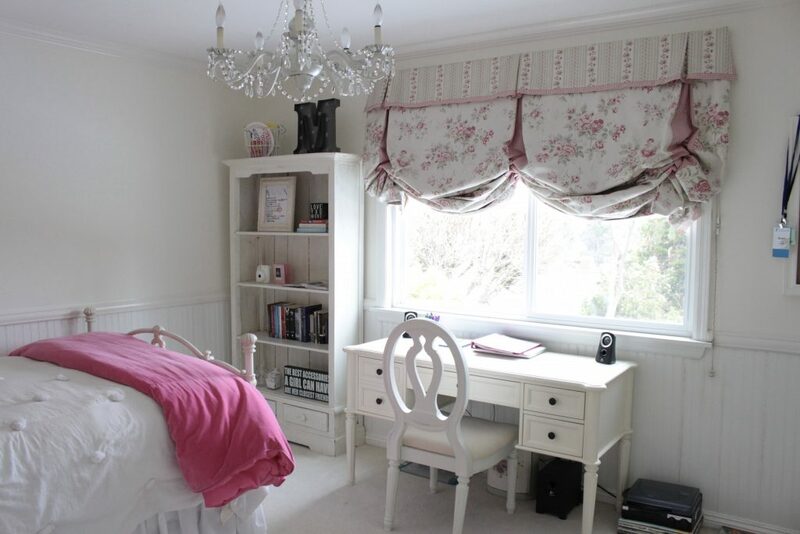 I love the double desk and the French country vibe. The soft colors are perfect for a shared office space. Wowwa!!! It’s all absolutely stunning Sheila! What a truly inspirational makeover! Your attention to detail resulted in a room that is perfect…functional and beautiful, and yet one in which hubby is comfortable as well! I love how you incorporated the travel photos. How special!! 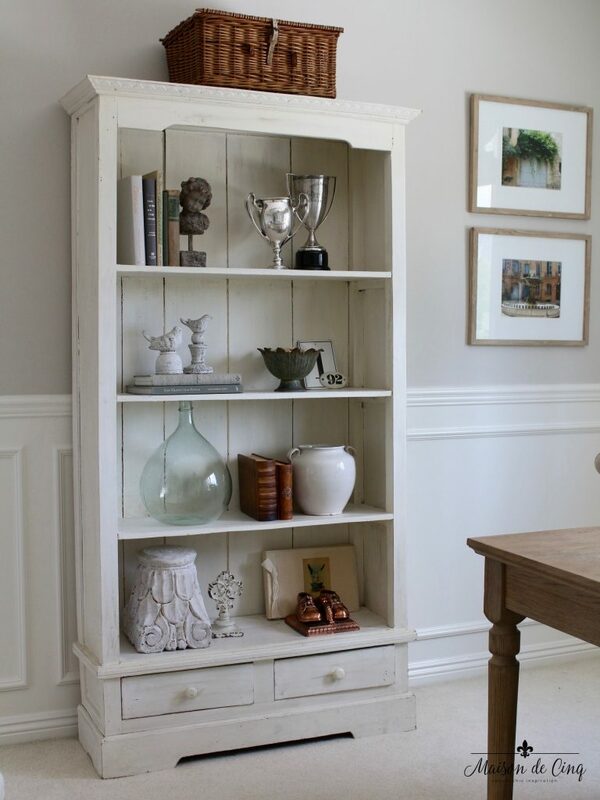 I also love how you accessorized the bookcase…actually I love EVERYTHING! I do have one question…where did you get the shade? It works so well in the room! Hi Debbie and thank you! What a sweet comment – so humbling and I so appreciate all of your kind words! The shade is custom (ordered through a local drapery company) and I’m sorry, but I don’t know the company name. I looked through their books and ordered through them and I looked at the paperwork and it doesn’t note any brand. So sorry I couldn’t get you more info! I have been excited to see the end result and it did not disappoint! Everything came together so well and is so balanced and beautiful! Nice job…I really enjoyed your post and watching the progress. Thanks so much – that’s such a nice compliment! I appreciate you following along so much. It’s been really fun to have all of you along! Sheila! I so enjoyed this post! Absolutely stunning office! You’re deff inspiring me to complete my office makeover! Love love love all of your French touches and this glorious color pallate. Thank you Tiff! I’m loving the color too, and am so excited to finally have an office- yay! Sheila, your office looks amazing! I love the double desks! So functional and so pretty. You nailed it! Congratulations on finishing up your orc and on having a beautiful office to work in! Sheila it turned out beautifully!!! Love the French chair and table! Great job!!! Aww, thanks Holli! I’m headed over to check out your she-shed tonight! Congrats on your ORC!! Well YAY for you!! It looks amazing…and as I’m sitting in my very messy office right now, I’m thinking I need a one room makeover right away!! You did such a beautiful job creating a serene place to work, it must feel just great! Congratulations!! Well done my friend!! It feels so good! Thanks so much Karen!! Love it Sheila! It turned out beautifully! The chair and round table are a lovely touch. I appreciate all the gorgeous details, especially your photos from your trip to France! Thanks so much Joan! Hopefully this space will make me more productive -that’s the idea anyway, haha! Thanks for popping over sweet friend! Sheila my jaw is on the floor!!!!!! The desks are gorgeous and I love the chairs! Even the sitting chair on the other side of the room! Every detail and us accessory is well thought and reflects your style. 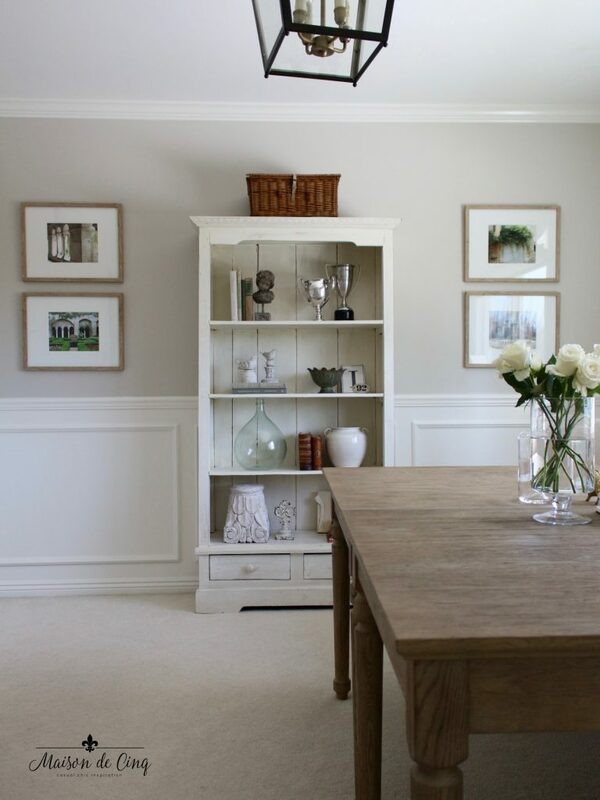 I love the wainscoting on the wall treatments so much! Really truly… This is perfection! So proud of you, my friend! It’s relaxing and soothing, yet functional and elegant! It’s perfect! I know how hard you have worked! And it shows! Brava!!!!! Aww Summer, thank you! It was a labor of love and it feels so good to have a space that is truly “me”! And it means even more when supportive friends love it, too! Sheila, your room is gorgeous!! 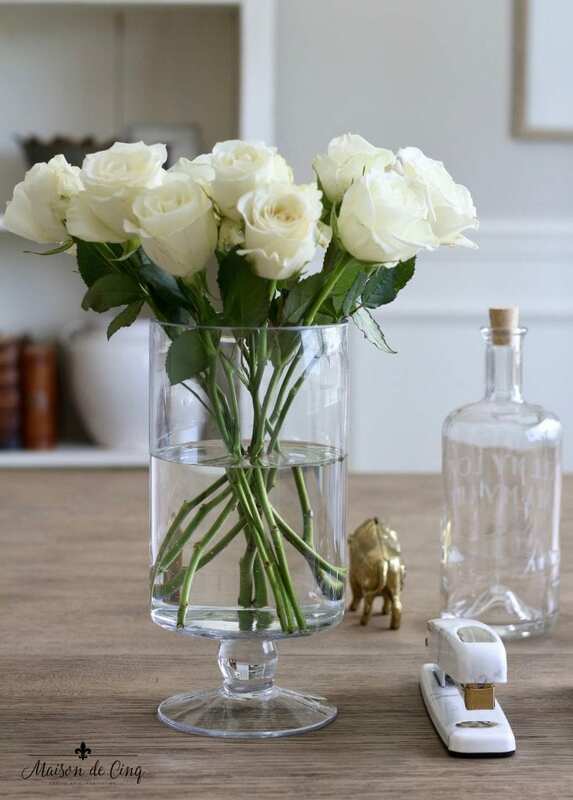 Like I said, it is SO your style and I love how peaceful and elegant it looks. Thanks so much Shelley! That’s the sweetest compliment! And peaceful is always good, right?! Can’t wait to see your final DR reveal my friend! Sheila, you have done an outstanding job here… I have to admit that you had me at the wainscoting already but the addition of the more french style items like that corner chair and table and the lantern – it took it to perfection. What a beautifully transformed space! 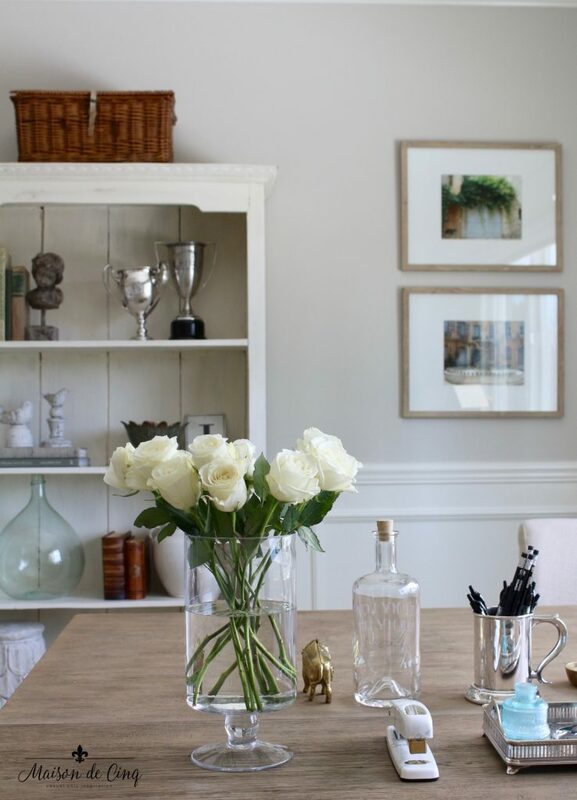 Love the clean, edited vibe—not always easy to achieve in a warm space punctuated with vintage and antiques! 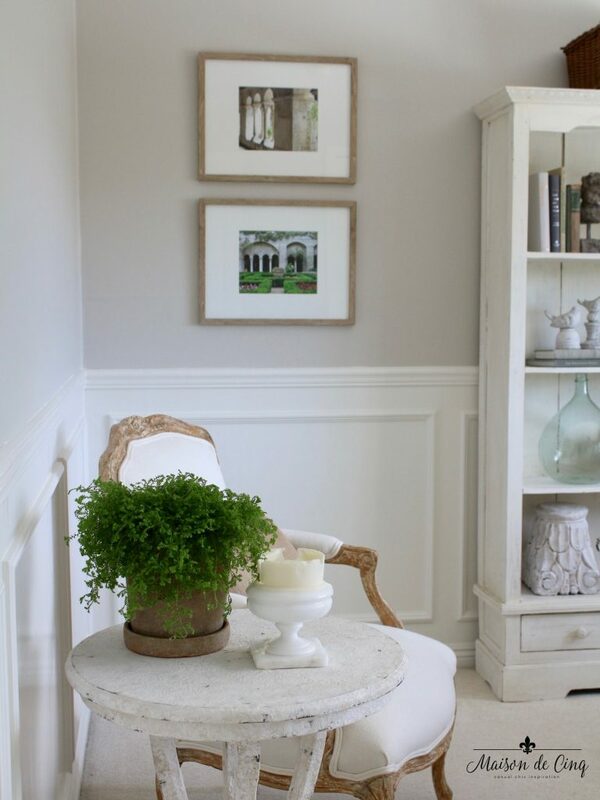 Love the wainscoting, the lantern, the mix of neutrals! Absolutely lovely! Thank you Carol – that is seriously the sweetest compliment! It is hard to balance vintage with a clean aesthetic and that is exactly what I was going for! Sheila you did an outstanding job!!! What a beautiful extension of your home. I love all the natural wood tones mixed with the soft white and gray! Job well done my friend. Sheila, I love the way it came out! It’s the quintessential balance of beautiful and functional and captures your casual chic style perfectly!! The greige color is just right and I so love the french chair and little table that you called a place holder… 🙂 Of course the desks and styled bookcase are lovely too. Great job!! Aww, thank you Lory! I love hearing that, because as you know, it’s easy to get carried away with the pretty and ignore the practical, haha! Hopefully I can find a chair that will be as pretty as this one – that may be a challenge! Thanks so much for your support my friend! Sheila, this space came out so beautifully! 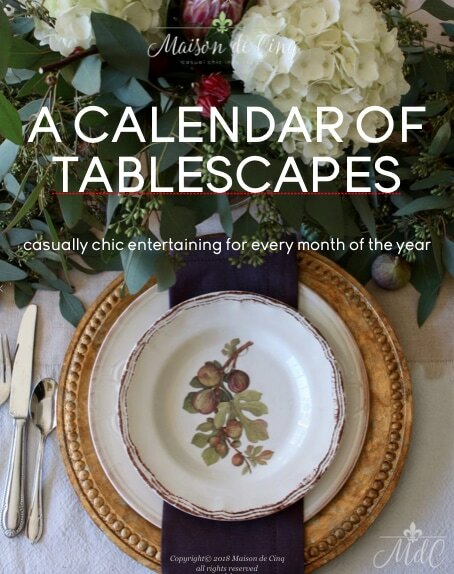 I love the back to back desks, neutral soft color palette and all your pretty styling! How special to use photos from your trip, love that gorgeous light too! I would love an office just like this!! Thanks so much Lisa! The ORC is quite a whirlwind, but it does feel so good to be done doesn’t it?! Loved your family room refresh, too! Bravo! 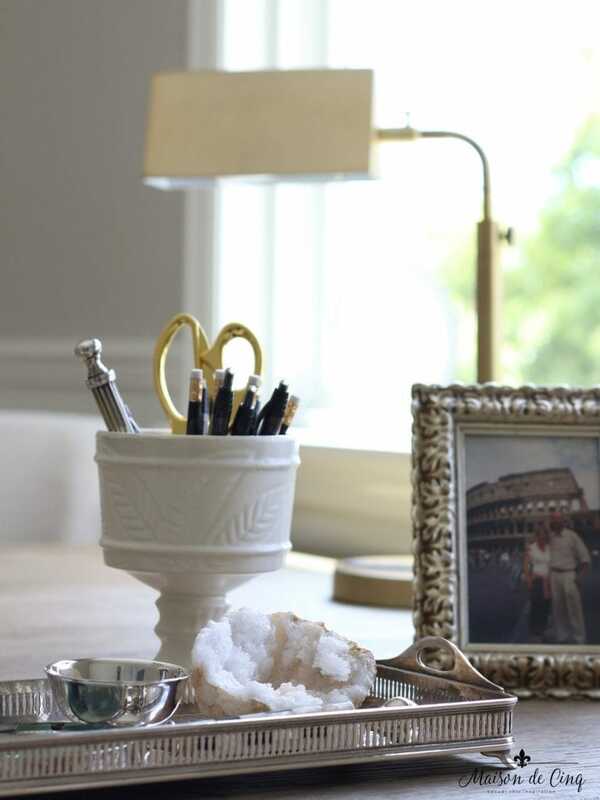 !…this office that you created for both you and your hubby is perfection! The office definitely appeals to and feels comfortable to you both in that you are surrounded by the things that you love and the furnishings are beautiful and gender neutral. I think if I shared an office with my hubby (he has an entire room as he mainly works from home) he would be very pleased with a room such as this. 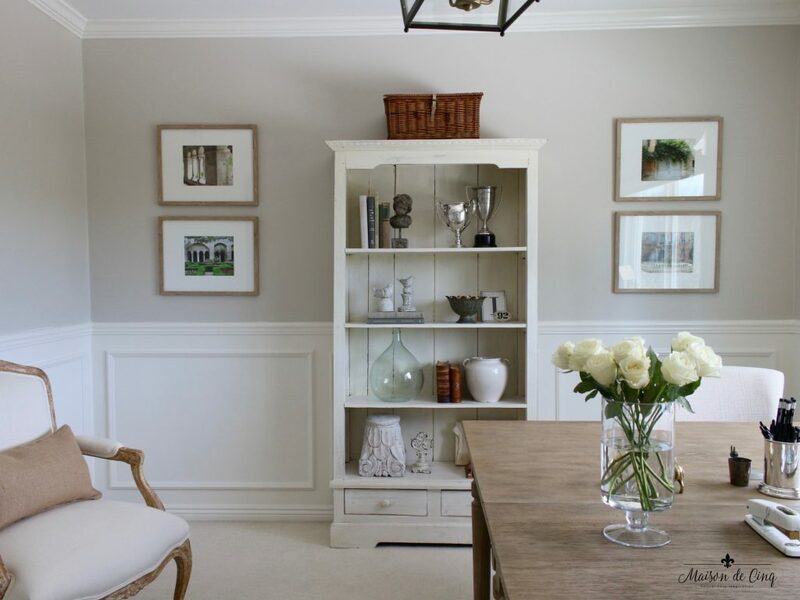 Love that you added the wainscoting….your hubby did a great job! You created and decorated a truly beautiful and functional room! Thank you Shirley! I’m so happy to have hit that “gender neutral” line – as you know I would have gone more feminine/French had I been able to! I appreciate your sweet comment and all your support – it means so much!